Our advanced scanning and operations software enables us to deliver the fastest, highest quality, and most affordable digital scanning service in the world. 1DollarScan, the most affordable digital scanning service, today announced Fine Tune, a new patent-pending technology that optimizes any type of digitally scanned content (e.g., printed books, magazines, business cards, documents, photos, etc.) for viewing on any eReader or mobile device (e.g., iPhone, iPad, Android, Nook, Kindle, etc.). Available for free, the Fine Tune technology enables consumers to view PDF files much faster and at higher resolutions and color quality than other digital scanning solutions. Digitally scanned content is growing steadily for a few key reasons. As consumers increasingly consume digital content, there’s a growing need to preserve, archive, search and view their existing printed content on digital devices. Since over 2.57 billion paper books were sold in the U.S. during 2010, there is huge potential for 1DollarScan’s services to grow in the U.S. (source: Association of American Publishers). The digital scanning market spans a wide range of use cases, including everyday consumers, businesses, and professionals such as medical researchers, attorneys, accountants, and university professors. Anytime, Anywhere -- Access and read digital content on any mobile device or laptop anytime, anywhere. Best User Experience -- Users can access and read digital content more quickly with higher resolution and color quality than other solutions. Most Affordable – 1DollarScan is the most affordable content scanning service on the market today. Pricing starts at $1 for up to 100 pages. For full pricing options, visit: http://1dollarscan.com/pricing.php. Consumers simply mail their printed content to be scanned and digitized into PDF files by 1DollarScan. The service also works directly with paper books ordered from Amazon. For a complete overview on how 1DollarScan’s services work, visit: http://1dollarscan.com/works.php. A full FAQ can be found at: http://1dollarscan.com/faq.php. 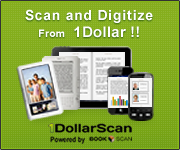 1DollarScan is the most affordable and efficient digital scanning service in the world.